Photograph by Lindsay CrandallIt was October of last year when I realized I was on track to read fifty-two books in a year. Somehow, despite having two part-time jobs (including a business I just launched), a husband with a rotating work and school schedule, and two small children, I was averaging a book a week. I was shocked. I had set out to read thirty books last year, knowing that my plate would be overflowing. But by October, I had long passed thirty books, and set my eyes on the Everest of book reading: fifty-two books in fifty-two weeks. But it was a surprise. You see, I don’t read one book at a time, cover to cover. I am usually juggling between two and four books at once, often finishing them all in the same week. So, though I averaged a book a week, I very rarely read one book in a week. The books I read were fiction, memoir, and a hefty dose of business books (for better or worse). I read chapter books aloud to my daughter. A few were gems that will stay with me for a good, long while. When October rolled around, I realized I was on track to do what I set out to do five years earlier. At that time, I had joined a group of readers who all set out to read fifty-two books that year. But I had fallen short by twelve books and put to rest any notions of achieving my goal. Until last year, that is. Somehow, I was reading and reading and reading, but I had no idea how I was finding the time to do it all. And I did it. I read fifty-two books last year! I couldn’t be more proud if I ran a marathon or birthed a child without drugs. I shouted it from the (social media) mountaintops: I read fifty-two books last year! And I was hit with a refrain that chimed over and over: How do you find the time? It was a question I didn’t know how to answer. The summer was intense as my business started to take off, and all the months leading up to it were spent preparing for the launch. The autumn was slower business-wise, but life was challenging in other ways: my daughter started kindergarten, my husband’s work and school schedule was grueling, and I was hanging on by my fingernails. When someone would ask me that question — how do you find the time? — I had a few answers. “I’ve always been a reader,” I’d say. Or, “I read whenever my kids watch TV.” Or, “I binge read on Sundays.” All of these answers are true, but none of them get at the heart of how I did this. The real answer is that I choose books over the internet and social media. I choose to read books rather than browse Facebook, Instagram, or Pinterest. I choose books over blogs and forums and e-mail. The answer is not finding the time, it’s choosing how to spend it. Instead of going online frequently, I put limits on my social media time in favor of moderation. 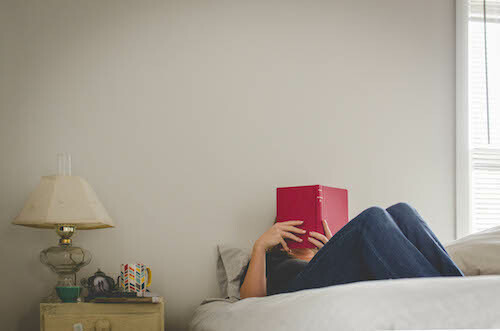 At the end of the day, for me, reading a book is more edifying and better for my well-being than reading through social media posts or falling down rabbit holes online. For me, it’s about putting the phone down and choosing something else. There is enough time for things we value. Annie Dillard so wisely said, “How we spend our days is, of course, how we spend our lives.” And she was right. How we choose to spend our time is how we choose to spend our lives. Last year, my time and my life were very much full of books. This year will be more of the same, only fewer books and longer ones. But no matter how much reading I do, I will continue to choose how I spend my time by balancing my screen time with real life, by reaching for things I value and love rather than continually reaching for my phone. Lindsay is a photographer and writer living in Rochester, New York, with her husband and two kids. More often than not, you’ll find her with a book or camera in her hand (and sometimes a glass of red wine). She is a collector of moments, a lover of light, a daydreamer, and a goal setter. Learn more about her on her blog or follow her on Instagram.